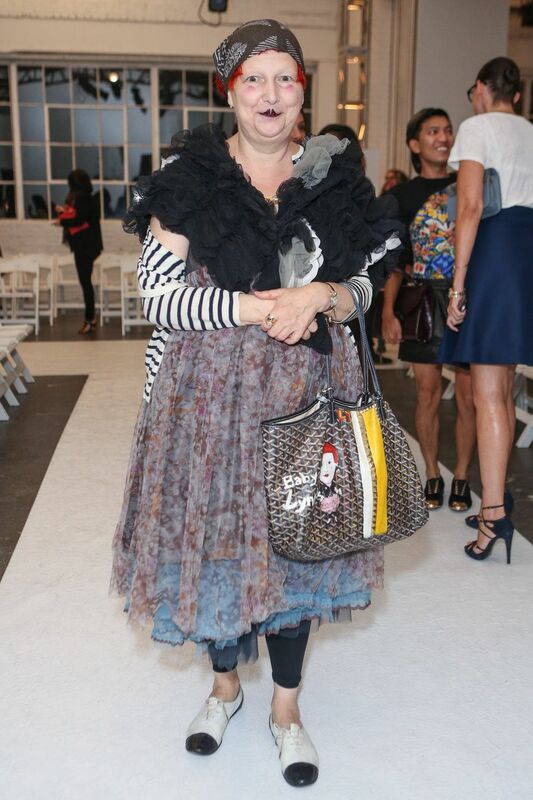 As a child growing up in Long Island, Lynn Yaeger didn't know what she wanted to be when she grew up, but she knew that if she just got her fashion look down everything else would fall into place. Decades later, Yaeger, a contributing editor at Vogue, as well as a fixture on street style reports from Paris to Shanghai, is not only one of the most successful and highly-recognized writers in the fashion business, she's also managed the impressive feat of regularly influencing the fashion world she reports on. Yaeger's signature style features voluminous crinolines peeking out over Repetto lace up flats, large amounts of tulle, a generous dose of sequins and an overall sprinkling of baby ballerina flapper both in terms of visuals and mood. It's all topped off with a kewpie doll beauty look of bee-stung lips, rouged cheeks and a henna'd bob. She's a lifelong devotee of antique jewelry and when even at her most casual she's festooned with rings and pins, always with a fascinating historical background for each piece. This Baby pin is a Victorian ornament for, that's right, a baby. That ring is actually a piece of mourning jewelry which spells out the intials of the dearly departed in human hair. An example of the sum of the sartorial parts not being greater than the whole, the finished look is equal parts Russian princess, silent film femme fatale and cartoon clotheshorse. "I remember seeing her around in the late '90s at fashion shows and events," supermodel Karen Elson says. "I remember being fascinated by her look because I kinda copied it!" Is there some sort of special bond between milky complexioned redheads? "Lynn and Grace Coddington I clearly admire and have a special kinship with. I admire Lynn on so many levels. It's hard to remain an individual in fashion [like she does] when fashion literally changes constantly." Elson feels Yaeger's influence hasn't been only personal, but also professional. 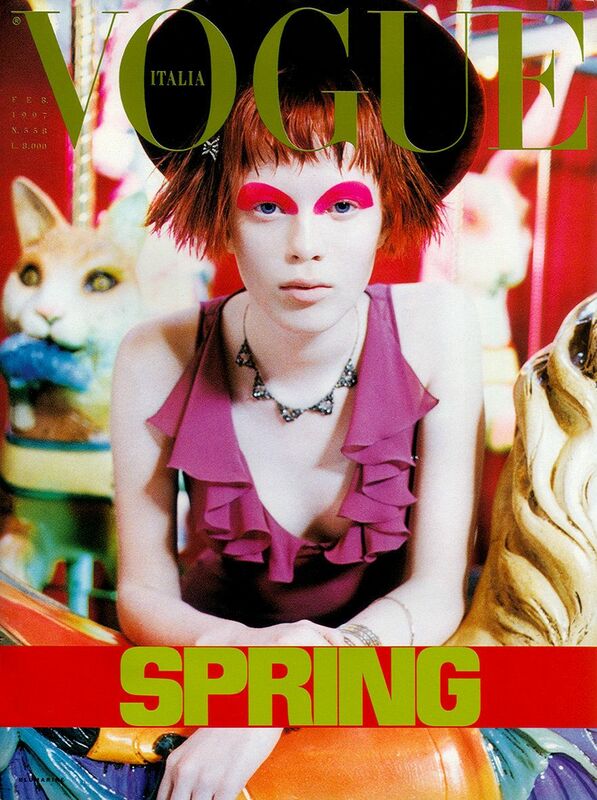 "I think my first Italian Vogue cover (February '97 by Steven Meisel) definitely paid homage to her and many of my first shoots during that time had blatant Lynn references." She continues, "I love Lynn's commitment to her style. It's self-expression at it's truest." "I love Lynn's commitment to her style. It's self-expression at its finest." Designer Marc Jacobs, whose shows are usually the blockbuster events of New York Fashion Week, is also a devotee of Yaeger. In fact, his Fall 2012 show, which I refer to as his Dr. Seuss Disco Pilgrim show, was inspired by Yaeger and other women of her style. The show featured an ethereal backdrop by artist Rachel Feinstein and a soundtrack comprised entirely of different version of the haunting Who Will Buy, from the soundtrack of the Broadway musical Oliver! creating a sweet, fairy-tale setting for the clothes. Oversized fur hats, chunky knit wraps, full skirts, shoes with giant crystal buckles, oversized handbags. The mood and silhouettes screamed Yaeger. "Lynn is a fashion person, a smart woman, a great writer and a great presence in our world, our bubble." Jacobs says. "At the point [of designing the Fall 2012 collection], I had discovered this website of street style of women who had eccentric flamboyant style. So I started to think about women that I've known in the fashion world like Louise Doktor. Lynn was and still is such a huge presence. She has a continuous presence like Anna Piaggi [the late, legendary Italian Vogue editor who was a poster child for avant-garde fashion and died in 2012]. In doing a collection, I always try to find multiple muses. There are usually some from fiction or from film, and then there's the real life ones which make what we show somehow credible. Like if you can prove in your mind that this person would wear these things, then it's not just fashion but they have the possibility of being clothes." "Lynn [Yaeger] is really an important representation of that desire, want and love for fashion, and she uses clothes and fashion to express herself." Jacobs explains that he needs women like Yaeger to do what he does. "I need to have that belief that this isn't just for show," he says, "that there are people out there who really love fashion, not just as something to look at, but as a form of self-expression and something that tugs at their heart — that isn't about need and isn't about practically, but about want, desire and self-expression. That is what I need to feel good about doing another season or another show. So yes, Lynn is really an important representation of that desire, want and love for fashion, and she uses clothes and fashion to express herself." Meanwhile across the pond in London, a city which Yaeger loves for its sartorial history, the Portobello Road market and its antique stores, a new generation of designers like Simone Rocha and Molly Goddard also feel the magic of Yaeger. Rocha remembers, "Since I was a teenager, she was floating around in my mind. I remember seeing photographs of her in lots of Comme des Garçons." Rocha has since become the winner of the Designer of the Year Award at the British Fashion Awards, as well as a friend and favorite of Yaeger. "I love Lynn in my clothes. She's so inspiring in how she wears my pieces, very naturally integrated into her own way of dressing. I particularly like it when she wears lots of different pieces at the same time like a skirt with another three dresses and a collar." In addition to serving as muse and inspirtation, Yaeger's influence is sometimes more literal and less abstract. Simon Doonan, Creative Ambassador for Barneys has been a friend and neighbor of Yaeger's for decades. Doonan recalls an episode with Yaeger involving the French luxury handbag company Goyard, which at the time was not sold anywhere in the United States. Yaeger, always shopping wherever her travel take her and endlessly searching for the unique, unusual and old-school, had fallen in love with Goyard in Paris, one of her most regular destinations. "The first time I ever heard the word Goyard, it was issuing forth from Lynn's bee-stung lips." Doonan says. "She was an early adopter. Lynn's embrace of Goyard helped give the brand an unconventional flava." Not long after Yaeger began carrying her monogrammed Goyard bag, Barneys opened an exclusive Goyard boutique in their Madison Avenue store. " There is a force-field around Lynn which screams 'fashion authority,'" he says. "Lynn's uncompromisingly avant-garde approach to style makes her a total raging standout. She is the Anna Piaggi of the 21st century. Lynn has joined that pantheon of women: Marchesa Casati, Daphne Guinness, Siouxsie Sioux, Nancy Cunard, Little Edie, who will always be sited for their fashion inspiration." As one of her closest friends, I can attest that Yaeger's commitment to her look is 24/7 and 365. There are no casual Fridays, although she has been known to work a beach look of an oversized Margiela smock with a vintage scarf tied doo-rag style and a pair of espadrilles from a tiny shop she found in Provence. Fans and fashion fiends approach her every time we're out together, telling Yaeger they love her work or they've never seen anything like her (or sometimes even confusing her for other legendary fashion icons like Isabella Blow and Dame Vivienne Westwood). 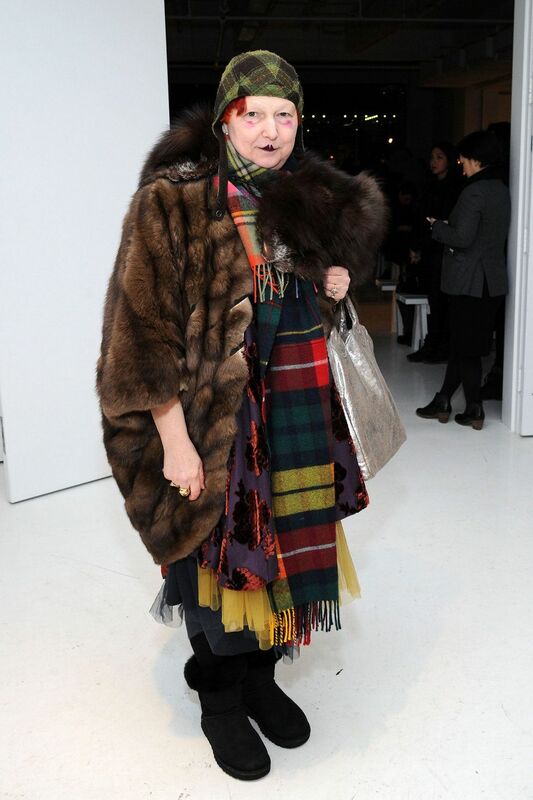 As Marc Jacobs said, inspirational women like Lynn Yaeger are what keep the fashion fantasy alive, and a little fantasy is needed now more than ever.